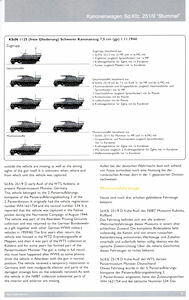 Nuts & Bolts Vol.21 Sd.Kfz.251/9 "Stummel"
Nuts & Bolts first published volume 6 on the Kanonenwagen Sd.Kfz.251/9 back in 1997 which had just 44 pages all in black and white with a mixture of wartime and museum close-up shots of the Stummel. 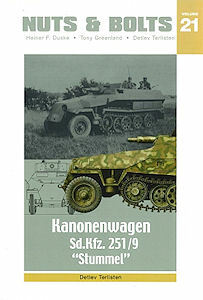 This new volume 21 also on the Kanonenwagen Sd.Kfz.251/9 "Stummel" is not a simply reprint but has expanded to 96 pages with many of the detailed walk around photos in colour as well as sections with 1:35 plans, colour profiles and modelling. Some of the original photos are still in the new volume along with many new shots, both wartime action and close-up detail shots making this a useful volume to get even if you have volume 6. The book is in the usual Nuts & Bolts soft cover A4 format with 96 pages that include both English and German text and includes many B&W wartime photos and colour walk around shots of preserved museum vehicles as well as numerous 1:35 plans and colour profiles as mentioned. 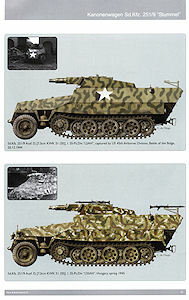 the book covers the initial Ausf.C "Stummel" as well as the early Ausf.D with the 7.5cm gun mounted in the hull front plate as on the Ausf.C as well as the later Ausf.D with the gun mounted in the additional upper superstructure, the three versions are covered an the wartime photos, walk arounds, plans and the colour profiles. 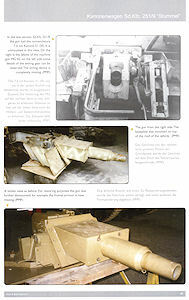 The first 18 introductory pages is mostly text with a few photos and covers the development history that includes a brief technical description as well as tables showing the production numbers, unit inventory from December 1944 as well as vehicle deployment and unit organization and colour and marking info. There are also tables listing registration numbers and a detailed technical description followed by a section listing all available 1:35-1:72-1:76 kits and accessory sets available for the "Stummel" at the time of publication. 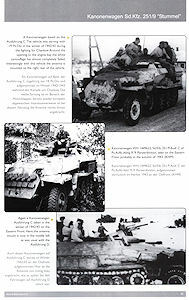 This is followed by 18 pages with black and white wartime action photos mostly 2 or 3 to a page with detailed captions in both English and German covering all versions that show some useful vehicle details as well as cam schemes, markings and crew uniforms with some nice diorama possibilties. 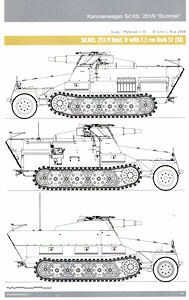 Next comes five view 1:35 plans of the Sd.Kfz.251/9 Ausf.C with 7.5cm KwK 37 (L/24), the Sd.Kfz.251/9 Ausf.D with 7.5cm KwK 37 (L/24) and Sd.Kfz.251/9 Ausf.D with 7.5cm KwK 51 (Sf) along with additional cutaway diagrams showing the internal gun mountings and ammo layout for the two different gun types used plus illustrations showing the other storage and radio locations that should prove very useful for those building a model of the "Stummel". The next 7 pages have side view colur profile illustations showing various cam finishes of the 3 different types with most of the illustrations including a small black and white wartime photo of the actual vehicle features in the profile to a good sense of how the vehicle actually looked giving the illustrations nice perspective. Pages 53 to 95 are devoted to close-up walk around shots of mostly preserved vehicles supplemented with some close-up wartime detail where available with the photos a mix of B&W and colour. The shots cover just about every aspect of the vehicles from the exterior hull, suspension and gun details to interior shots showing the driver's position, vision visors, seats and very detailed look at the gun, gun mountings and gun controls. 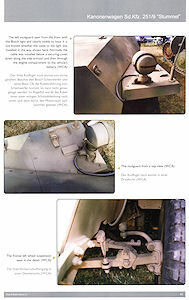 There are mostly 3 or 4 shots to a page along with quite extensive photo captions to describe the detail being shown and while the photos are not huge they usually cover just one detail part and so are large enough to show the detail nicely as well as some shots of the gun mounting outside of the vehicle to give additional detail views. 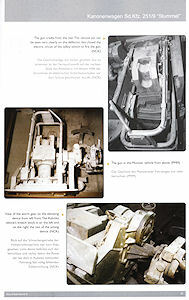 There is one caption error carried over from Volume 6 when the research was not a good as it is today where a shot of the rear steel cleat track used for about five months from late February to around July 1944 when it was discontinued as the metal pads created excessive vibrations on paved roads damaging the suspension components and was not produced just in the last months of the war as usually reported. Indeed there is a photo in this very book on page 26 of an early Ausf.D with the steel cleat track taken early summer in southern France which contradicts the photo caption of the steel track on page 88. The final few pages have model photos of the late "Stummel", one being a conversion on the Tamiya early 251/9 and the other using the AFV Club kit #AF 35068. This is another excellent volume in the Nuts & Bolts series covering the Kanonenwagen Sd.Kfz.251/9 "Stummel" and having the volume concentrate of this one 251 version out of the 23 sub-types built allows excellent coverage of the vehicle in photos, plans and technical data. The book has a good mix of wartime photos, museum walk-around photos and extensive 1:35 plan coverage and is just the reference for those building a kit of the "Stummel" if you haven't already or a good reason to build another with the additional information in this volume. 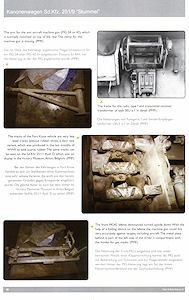 Additional information on the steel cleat track as incorrectly captioned in the book and commonly miss-reported. Sorry, but this is a pet peeve of mine so sorry to bore you.